Airtech, offers social housing providers a complete solution to help protect residents from the risks caused by Radon gas in the home. Domestic exposure to radon increases the risk of lung cancer, with 1,000 to 2,000 deaths each year estimated to be caused by exposure to the gas. 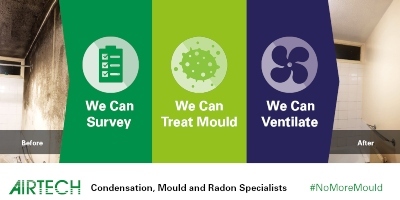 Since Landlords have a responsibility to their tenants under Duty of Care and the Housing Act to provide a safe home, radon is a major consideration for social housing providers. Luckily Airtech has 30 years of experience in radon prevention and can offer a full range of products and services, from radon testing to full remediation of housing stock.